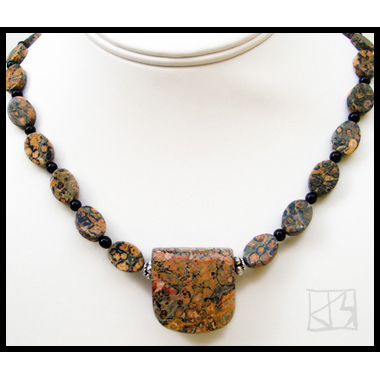 Contemporary lines with fierce jungle roots are embodied in this colorful center stone. Cut from the same rough to my specifications, the smooth ovals have unique flat sides, creating what I think is a more harmonious line. 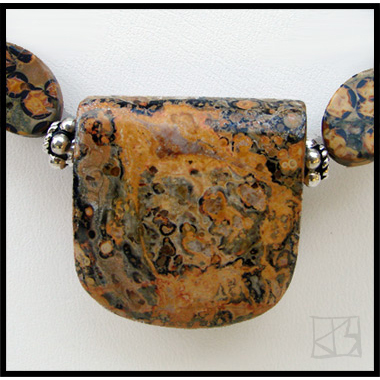 Small genuine onyx beads work to bring out the vivid colors of the jasper. Bali .925 silver beads and clasps finish this organic piece. Wild cat, wild woman! This beauty expresses your inner GRRrrr!